Belissimo is a classic online video slot game from Microgaming that has been released in November 1999. This online video slot machine game has 3 reels and 5 pay lines. The theme of Belissimo is all about the pizza- and pasta-loving Italians. Most people aren’t really sure what “Bellissimo” exactly means. Yes, that’s with a double L. It simply means “beautiful or handsome” but the term is not only referred to women or men. It can also be used to describe something else; for instance, books or other objects. Several online slot players love playing classic slot machine games as it brings out a genuine impression of a real land-based casino slot machine in every way. Belissimo may not look very interesting for a lot of players at first glance, but once they got to play with it, they admitted that they have enjoyed playing this classic yet rather fun slot game. Microgaming online slot games are accessible to players in 2 formats – download and no-download. Most people typically prefer to download software because they can enjoy Microgaming’s entire list of online slot games in one download only, while there are those who would like to play instantly so that they can find out if a certain slot game is fun and exciting enough to spend their precious time and real money with. Whether you like to download their software first or you prefer to play instantly without the need to download, then Microgaming surely has slot games to cater to your specific slot gaming standards. Belissimo belongs to the instant play category of Microgaming slot games, which means it can be played for free or for real money without the need to download anything. When it comes to Italians, you usually think that they typically eat only pasta and pizza. Of course, traditionally, pasta is already a one-meal course, but Italians can cook other things pretty well too, such as vegetables (think caponata and ratatouille), salads, soups (minestrone), mushrooms, polenta, truffles, etc. In short, Italians can cook “Bellissimo” food! The Belissimo online slot machine game features 3 reels and 5 pay lines, no fancy stuff to remember, a Chef wild symbol, and the maximum payout you can get is 5,000 coins! Would you like a slice of pizza? Then come visit and play the Belissimo online slot game, where you can eat pizza to your heart’s delight, meet the jolly Italian chef, and get to win cool prizes! When it comes to downloadable software from Microgaming, your game play is guaranteed to be fun and exciting as they provide stunning graphics, a wide selection of games, and most of all, it is absolutely user-friendly. If you have ever eaten pizza, then you will be quite familiar with Belissimo’s theme – the hot oven, the Italian chef, and the tasty pizzas he makes. Belissimo looks like the traditional slot machine that you typically see in land-based casinos. Since it is essentially a no-frills type of slot game, Belissimo has been designed to have a genuine casino ambience with matching sound effects, which makes you more convinced that you are in a real casino playing an old-school slots game. The casing of the reels includes the reels, buttons and the paytable. The icons or symbols used are very simple, with bars, sevens, and the Chef wild symbol. The overall graphic design of Belissimo displays a red-and-white checkered backdrop, which resembles the usual tablecloth of Italian pizzerias and restaurants. Other colors used in the game are green, blue, purple, black, white, orange and yellow. 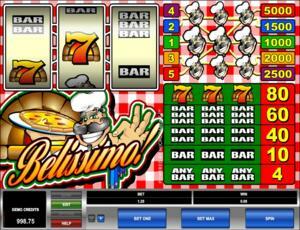 Since it is a fairly simple slot machine game, Belissimo does not have too much sound effects. There is no background sound constantly being played. When you spin the reels, background sound effects you’ll hear will make you think you are in a land-based casino playing a traditional online slot game. Light and upbeat music will celebrate your wins whenever you get winning combinations. There are no regular card deck symbols available in the Belissimo online video slot game. The regular symbols that you will find in the Belissimo slot game are the 3-Bar, 2-Bar, 1-Bar and the Seven symbol. The Wild Symbol is the Chef symbol. The Chef wild symbol acts as a substitute for all other symbols in order to help you form winning combinations. You are paid varying prize amounts (refer to the Payout table) when you manage to form a winning combination with multiple Chef wild symbols on an enabled pay line. There is no Scatter Symbol in the Belissimo online slot game. Since Belissimo is a traditional, old-school 3-reel slots game, there are no bonus features in this game. Belissimo has 3 reels where you may bet on 5 pay lines. The minimum bet is 0.25 and the maximum bet is 20.00 per line. You can wager from 1 up to 5 coins per pay line. Thus, the minimum amount you can bet is 0.25 and the maximum amount you can bet is 100.00 per spin. The maximum payout in the main Belissimo online slot machine game is 5,000 coins. Belissimo is not equipped with an Autoplay function.